Slightly taller (700mm) than the most common 600mm height stands in Atacama's SLX range, making these an ideal choice for deeper/wider speakers that you need a little higher. Atacama SLX 700 is a 700mm high version of Atacama's SL speaker stands (includes gel pads), ideal for shorter bookshelf speakers or simply for supporting your speakers a little higher, available in black, silver or white. All Atacama SL models have identical top and base plates but differ in height. The vertical columns can be mass loaded with Atacama's own Atabites for optimum performance of your speakers. Includes heavy duty carpet spikes as standard. Top spikes or gel pads for the top plate are available separately. SLX 700 measures 700mm in height (27.6") in height (excluding spikes), an ideal choice for supporting taller bookshelf speakers if a pair of "industry standard height" 600mm tall stands aren't tall enough. 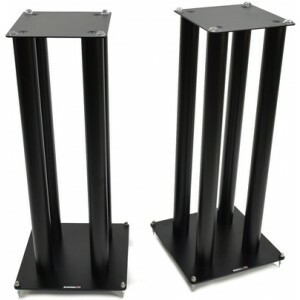 When selecting your speaker stands, consider your general listening level and speaker size. As a general rule of thumb, you want the speaker's tweeter to be at ear level. The Atacama SLX 700 includes Atacama isolation gel pads and is available in a range of colours. We also sell SL stands in other heights. 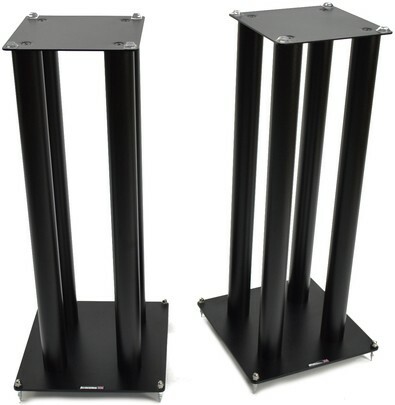 As these speaker stands use isolation spikes, two sets of four Atacama HD-S (Nickel finish) spike shoes are recommended to protect delicate floor coverings.